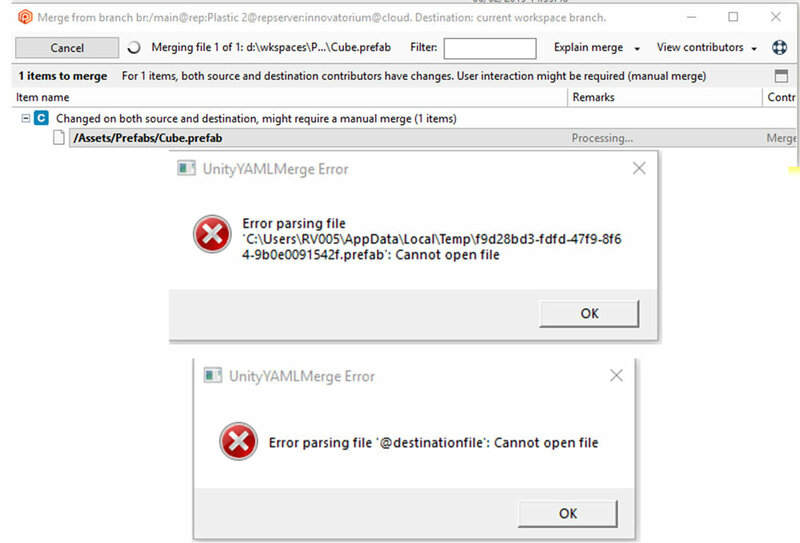 It seems that Unity external Merge Tool is not properly defined. Could you check if the tool is available on this path? Could you check if the tool is available on this path? 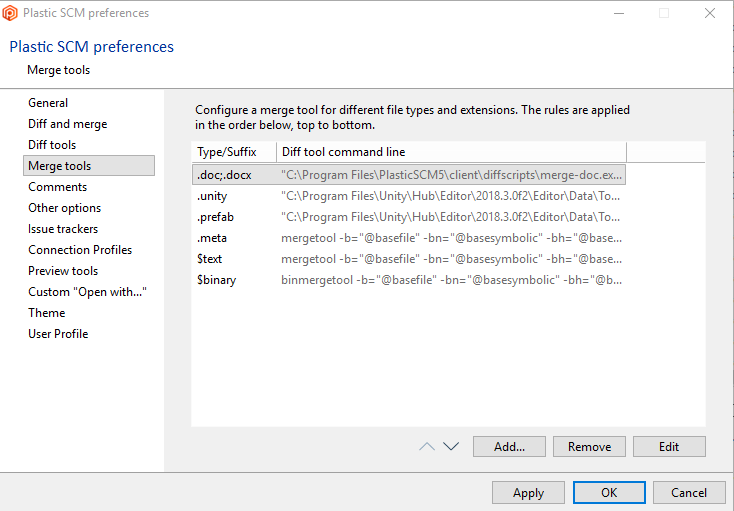 From the Plastic GUI --> Preferences, you can configure the external merge tools (eg: UnityYAMLMerge). Plastic just try open the external merge tool based on the configured parameters. You need to be sure the external tool path and required parameters are correct. I'd like to try again but i get the error message telling me a merge is in progress but I had to close that window to access preferences. How do i open it again? "C:\Program Files\Unity\Hub\Editor\2018.3.0f2\Editor\Data\Tools\UnityYAMLMerge.exe" merge -p "@basefile" "@sourcefile" "@destinationfile" "@output"
<C:\Program Files\Unity\Hub\Editor\2018.3.0f2\Editor\Data\Tools\UnityYAMLMerge.exe> merge -p "@basefile" "@sourcefile" "@destinationfile" "@output"
<"C:\Program Files\Unity\Hub\Editor\2018.3.0f2\Editor\Data\Tools\UnityYAMLMerge.exe"> merge -p "@basefile" "@sourcefile" "@destinationfile" "@output"
I checked if the path is wrong but it seems right. Found it. I had to do it twice for both scene and prefab and not with .prefab;.unity . 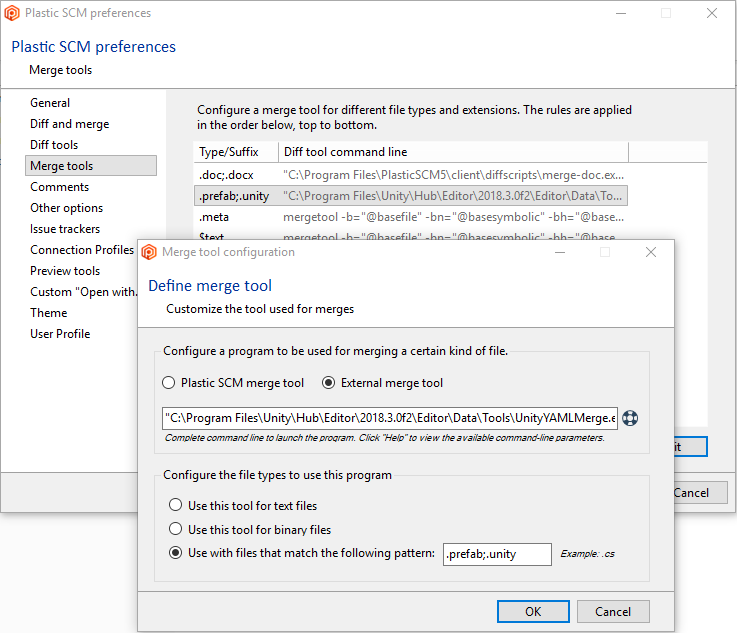 We made the same configuration for the merge tools. Can you share how do you have it configured in the "client.conf" file (by default at "C:\Users\<your_user>\AppData\Local\plastic4")? So, i went back home and tried a merge with my other computer and it worked fine. We also installed a the latest Unity version and linked to a fresh install of UnityYAMLMerge.exe in case the existing one was corrupt but we get the same error. I think Nicolas issue might come from his computer. If anybody as a suggestion, they are welcome.